I used a flexible frame as suspension, this helps to keep it lighter, there is no need for a lot of parts to create a 4 link or other suspension. 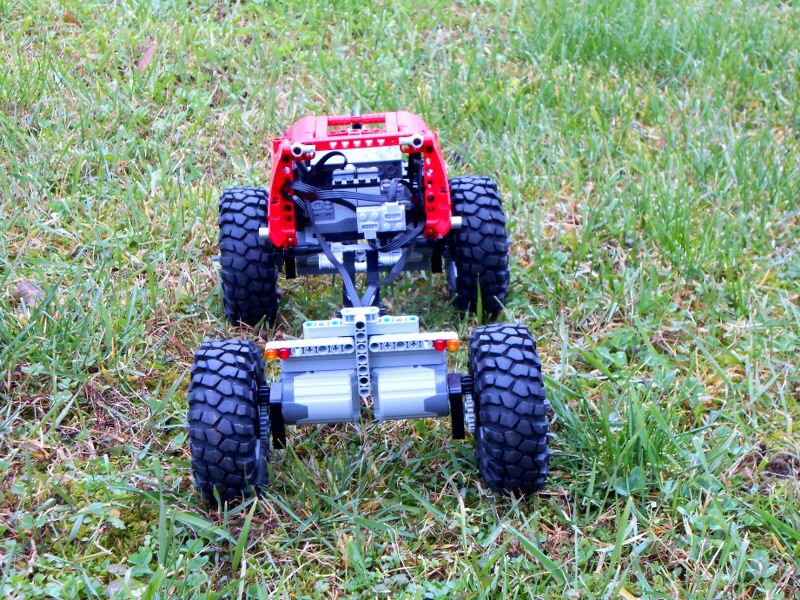 As you can see below in the video, this "suspension" also works well on terrain. Has LiPo battery, and V2 IR receiver. There are two receivers, two XL motor is connected to each, there are 4 XL motors in total. After the motor's output, a 24:12 gearing (deceleration) is built in, so the wheel spins about 85 rpm, which allows to reach 1,7 km/h. 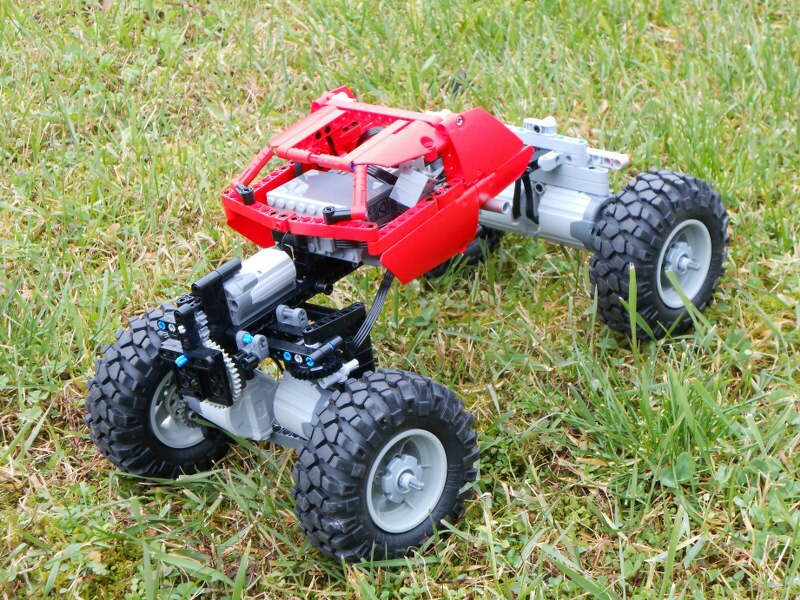 The wheelbase-width ratio is similar to real RC crawlers. 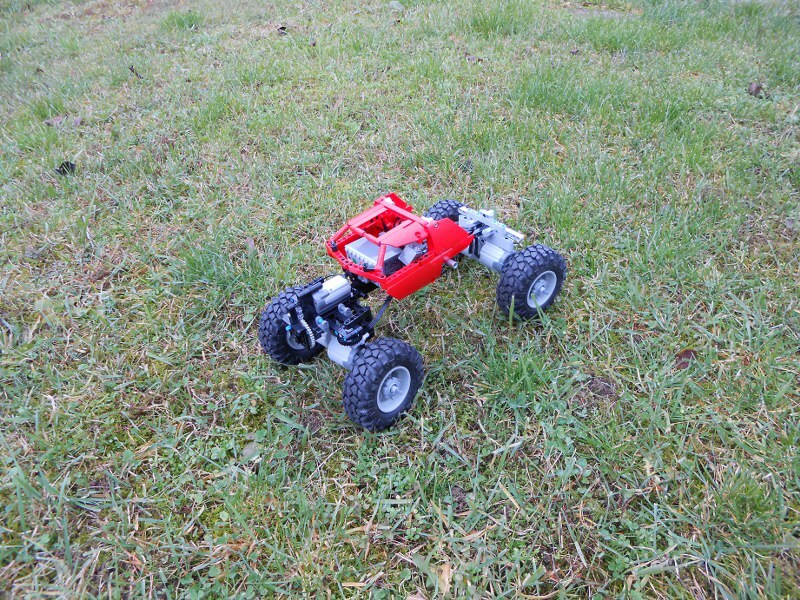 I tried to add a big ground clearance, there was no problem with it. 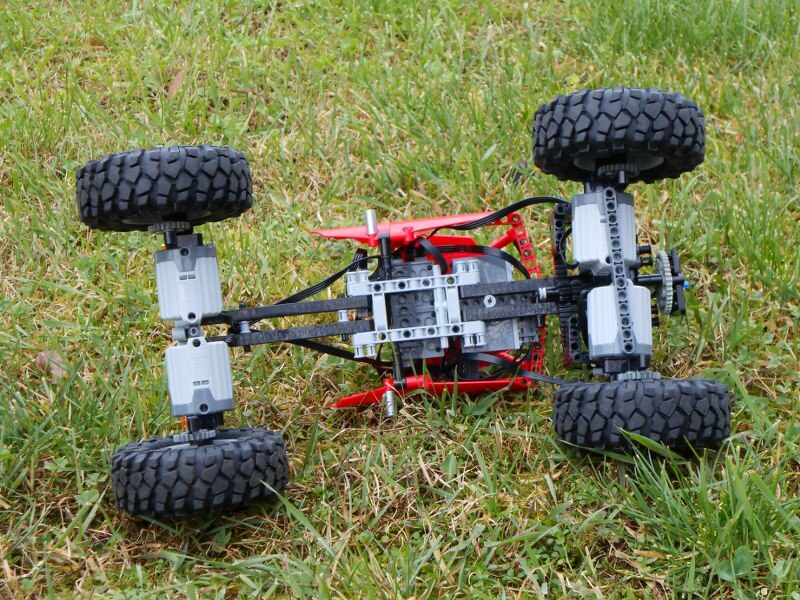 It's an advantage of this flexible chassis, there is nothing under the middle of the vehicle. 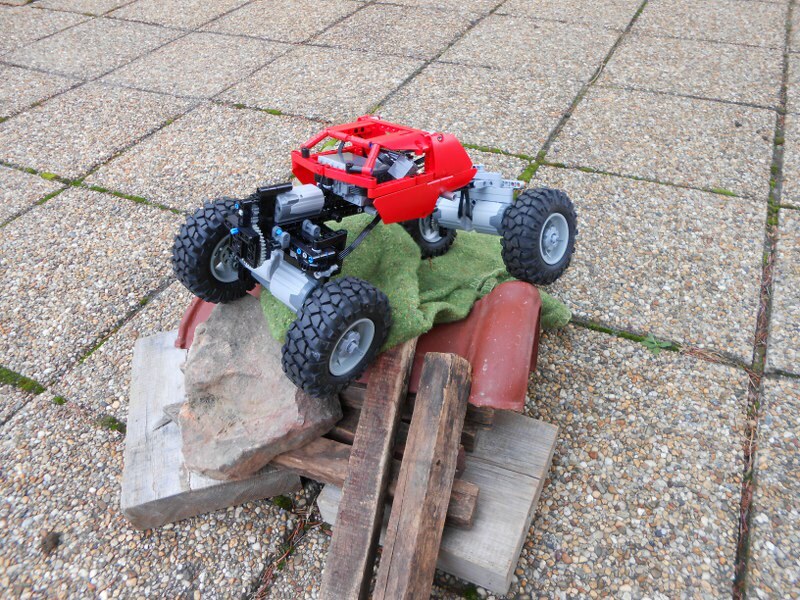 The wheels are RC4WD 1,9" Rock Crusher XT's, their weight helps a lot of the stabilization of the vehicle. The XL motors are placed low, they also help to have a better center of gravity. I added a simple body, with more crawler-like look, than in my previous crawlers. One M motor steers the two XL motors in the front axle. These motors are connected to mini turntables to be more stable and robust. I don't know yet the number of pieces, but it can be about 200. Simple and fast! Its great! Very original and light construction!!! Does one LiPo batery power four XL-motors without any problems? Another TT with no Lego Shock Absorbers. Is this the Future of Trial Trucks? Great design and very good performance! This has all the right ingredients: light weight, power and simplicity. Very very capable and a nice antidote to all the suspended crawlers that you see. Keep it up man! It depends on the builder, if you like them, you will use them. The truth is, in 99% of 4x4 off roader constructions, shock absorbers are unnecessary. A linked suspension is always more stable and gives more optimal weight distribution, better center of gravity in terrain. 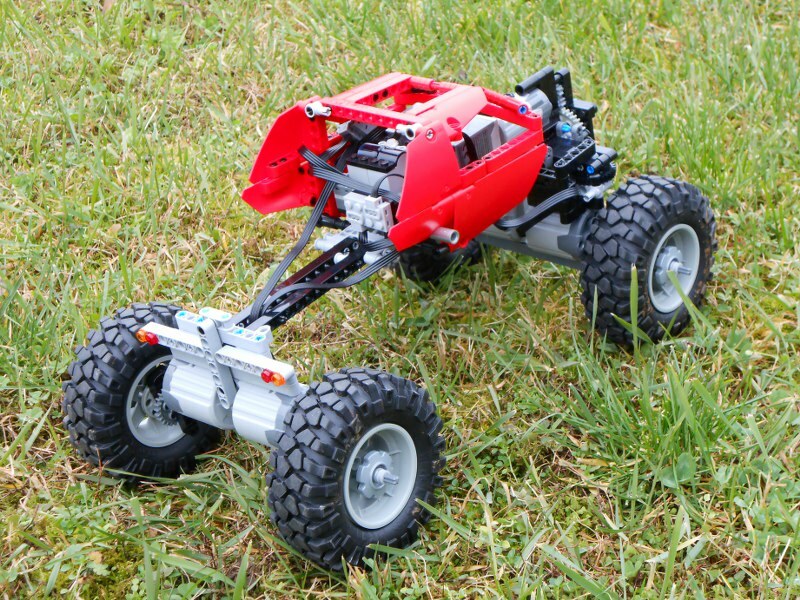 Lego vehicles in this speed (under few km/h) don't need shocks. We use them in suspensions to make the axles/wheels back to the original position, once they are moved by terrain. But there are so many different constructions, sometimes it' much better to use springs (Lego shocks are only springs, except for the one in 8466 door mechanism), e.g. for crawlers, realistic models, Tatra. I don't think non spring suspensions will be more popular in the future. Yes, in this weight one LiPo is enough. The terrain in the video was pretty hard, but had enough power to go through. 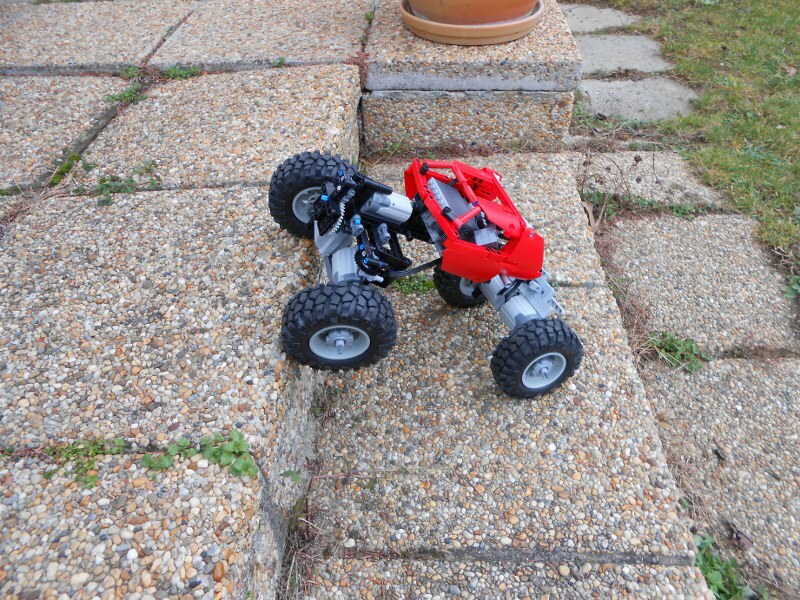 Falling back or rolling down is the real problem (as in every crawler). With two it would be more powerful, but more heavy, and I have only one LiPo. It would be difficult to place a second LiPo under the small body. Amazing! That is a clever design. Other than that nice job, I like how the tires dont have anything in the way of them (chassis is above the wheels) so it can drive over tall things. Shame theres no larger wheels. I'm afraid I don't fully understand your first sentence. 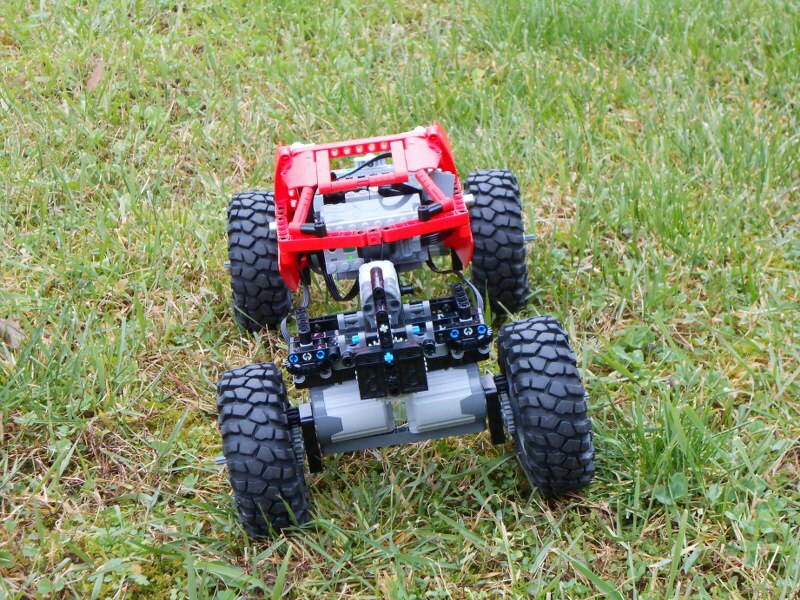 That's a great crawler. Watching the video I began to think " will it go up stairs", then it did! 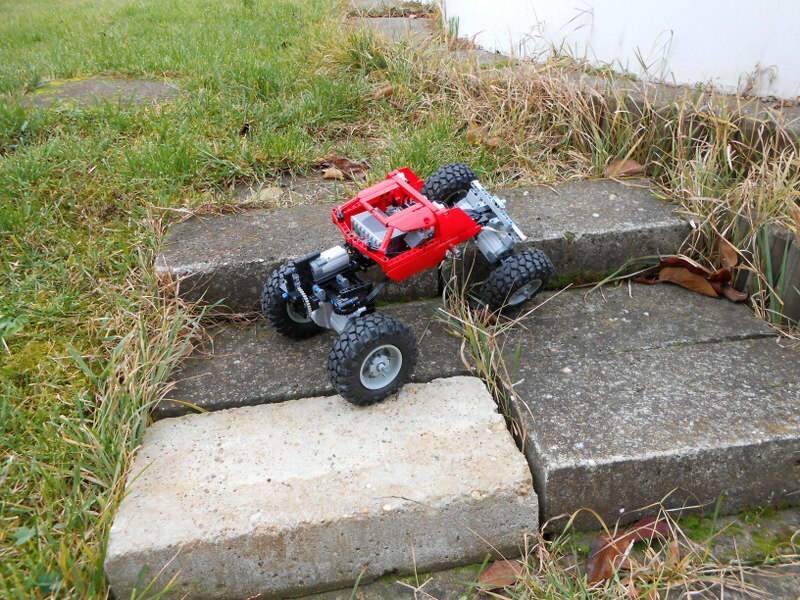 I wonder if you could build a shorter wheelbase version as I noticed the chassis hit the stairs as it climbed down. A minor negative but I would build one if I had four XL motors, a clever design. You are absolutely right. That's why I connected all motors to channel one and to the same colored output. So I can control it with the speed remote controller (except in 1-3 level, those have little torque with this gearing). You can see an example in the video from 0:21 to 0:25 - typical case, when low rpm is needed to win against tricky terrain. Wish me luck :) can't wait to start!!! Maybe you can enter this in the [MINI] contest! Wow! You weren't kidding about the lightweight chassis. As said by others ... weird looks but, looks like great fun. And, at 200 odd parts, really quick to put together. I wonder if an L motor version would work? Great performance but man, it's an ugly little critter!